See, I told you I was working on my boys' room. 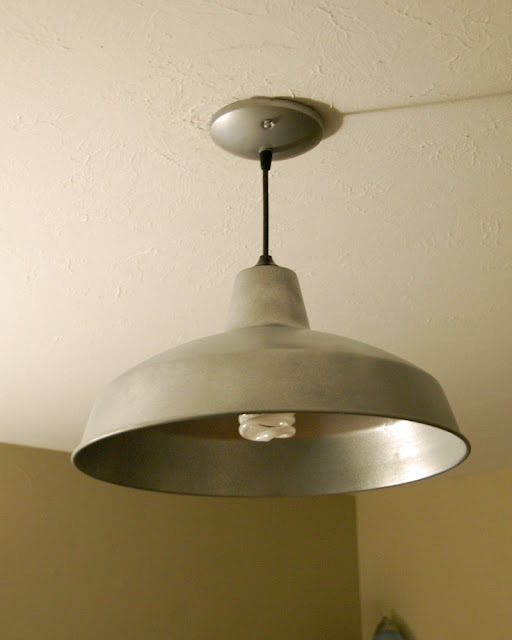 If you saw the design board I posted earlier, you may have noticed an industrial looking warehouse pendant -- I did buy it for an outrageously affordable $25 from the big orange HD. It was just too shiny and new looking though, plus the inside was white, and say what you will about white reflecting light, blah blah blah... I wanted a more weathered look -- something that looked a bit like galvanized steel or at least something old. Something that may have actually been in a warehouse? Maybe an old one by the sea, oxidized by the salt air? Look at me imagining life stories for my light fixtures. Time to pull out my trusty spray paint! The good news is this was incredibly easy, and I'm over-the-moon happy with the results. 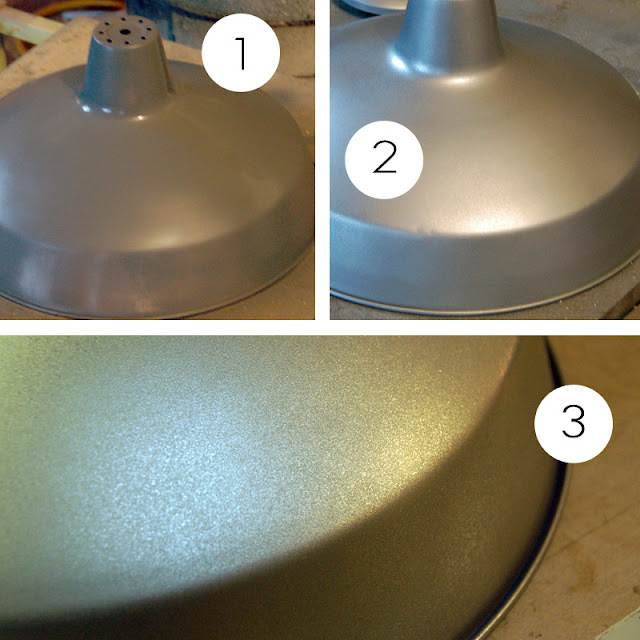 Gray primer, Rustoleum's Metallic Matte Nickel and Krylon's Original Chrome (the stuff I used for my lazy man's silver leaf mirror frame). Look at me, being such a rebel... Rustoleum and Krylon, playing nicely together on my little project. 3. Lightly and unevenly spray with the Original Chrome paint -- resulting in a flecked, mottled appearance with a bit of texture. Not bad for a $25 fixture, right? another day, another great project!! It looks great! I love the "after!" much better than the shiny new look, and $25 is pretty darn good! Nice paint job! 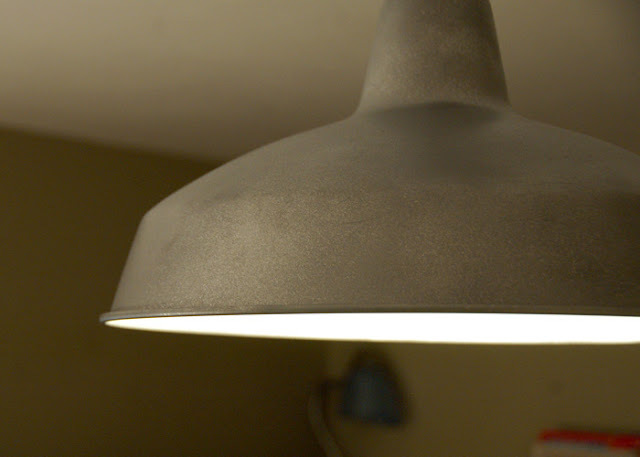 I was actually going to do something similar with the same kind of warehouse shade, but then found an awesome fixture at Ikea for the same price of the shade alone (I guess I was looking in the wrong spot). I really want to distress the ikea fixture, which is shiny aluminum, but my boyfriend loves it, so I guess I'll give it a go as is before following in your footsteps! Looks awesome! The before and after is amazing!!! Visiting over from Thrifty Decor Chick. This is awesome! I love a little industrial look but not in a shiny way. The more rustic authentic industrial look you got through paint is great! Becky, hmm I never thought about that but it might work since the base coat is solid anyway? ?